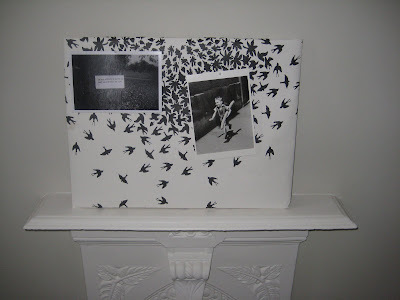 You need to realise that I am not a person who makes things. Ever. I like to cook, but I'm not one of those people who sits in front of the tv with their knitting, surfs the Martha Stewart website, or who handmakes Christmas presents. I do aspire to these things, but my mind is consumed with tidying and decluttering, and until that's finished (which has been an ongoing project for nearly 33 years) I don't think I am going to turn into a big crafter. What I'm saying is that this simple project may be totally unimpressive to most of you, but I am rather pleased with myself, especially as it took about five minutes to do. 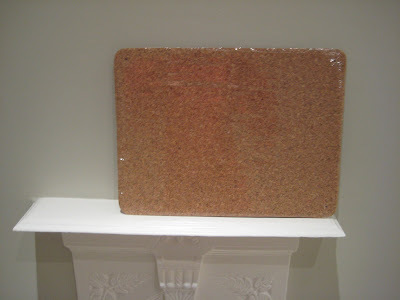 Take one cork board, bought for 50p at Woolworth's closing-down sale. One wallpaper sample, a few laughs at 30 Rock, and a staple gun later, and I have a new noticeboard. Don't keep me from the light. I had forgotten about it until I was looking for something to pin on my noticeboard, so it was an added bonus to rediscover it, as I think it makes my top 10 poems. So, sometimes even a small project can be the catalyst for something more. The corkboard turned out wonderfully... and what an extra bonus to find the picture and poem! it looks so gorgeous! love the pattern of the fabric, and a beautiful poem too? what a treat! I am not crafty or creative at all, so even this would probably be a challenge for me- but I'm so willing to try it anyway! Summer - you can't go wrong - it's just like wrapping a present, you just staple, or even tape, the paper at the back. EASY. Wow! great project, love it! Have never seen that fabric before, so unique... great idea. I always have the intentions of creating something but end up just collecting the ideas and never doing something about them. This looks great.